The above photo is courtesy Doug Kerr. 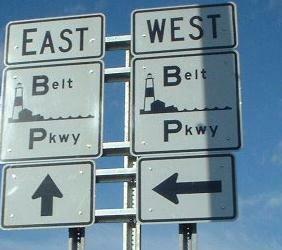 Right: Although the Belt Parkway has taken over Shore Parkway (as well as Southern and Laurelton Parkways), the name lives on in the frontage road. This is on Cross Bay Blvd. SB at Exit 17 - the left turn is actually onto NY 27 EB, Conduit Blvd. Shore Road Drive, the connection from the the end of the Belt Parkway into Brooklyn. In the original system, this was the four-lane beginning of Shore Parkway, which continued around the entire route of the Belt as far as JFK Airport. Now, the main part of the Belt is six lanes with a center median, and this has been striped to two lanes for safety and lack of traffic.